We asked our respective patients and compared notes; despite being in different states the answers we got from them were identical. Hmmm…. So we posed the question on Facebook and it felt like someone had been eavesdropping on our conversations because our Facebook peeps gave us the same response as our patients. The preferred weight management option became pretty clear but could it just be that the folks we asked were already connected to us in some way and total strangers would hold a different opinion? 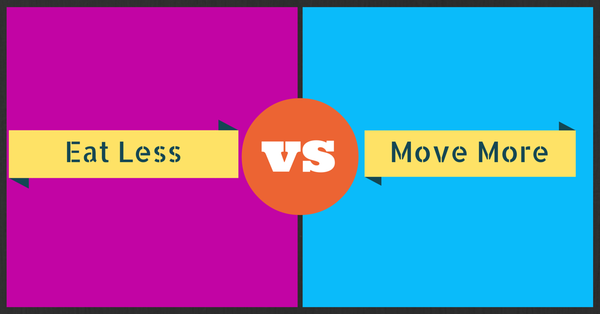 So we did and you guessed it- the answer to the move more vs eat less conundrum was the same. Then it dawned on us. We (society, medical community and media) have been going about this weight thing the wrong way the whole time! Going against our natural tendencies is just hard to sustain long term. No wonder we are all battling the bulge! Let’s have some fun here; ask yourself and the folks around you what they would rather do; eat less or move more. To lose or maintain your weight, what would you rather do? The more interesting and current research is that diet and exercise alone are NOT sufficient for losing weight. Finally we have more complete information to battle the national bulge — sleep, stress, sugar have to factor in. Calories in; calories out is not telling our people the whole story. (Bummer, as it’s the story I’d been telling thousands for 30 years. We do the best we can with what we know). Anyway, love that you are opening up this discussion. I look forward to what you reveal in 2015. Thanks for such a thoughtful comment Kymberly. Learnt a lot from it. The “big reveal” would probably be underwhelming for you. Without revealing too much, it’s more of a changing our emphasis by doing more of what we want to do naturally instead of being stubbornly fixated on a model that has not been shown to work consistently for weight loss.